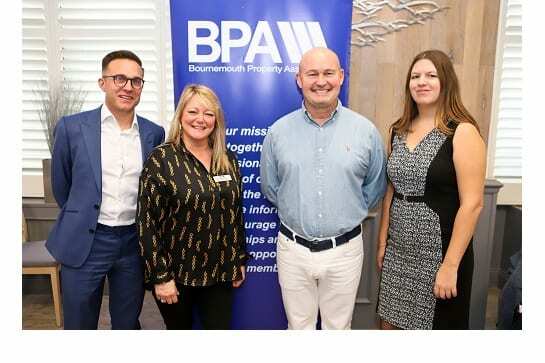 FOLLOWING the Bournemouth Property Association’s AGM last month, the first job on the agenda was to extend a very big thank you to the outgoing committee for their hard work during 2018. The committee then all stood down and the new 2019 Bournemouth Property Association committee were voted in. Alex Eaton, Chartered Marketer and Chair, said: “Last year was a great year for the Association. We organised and hosted twenty-three events across the year and all were a great success. This is my third year in office as Chair and I will use it to continue to grow the relationships I have been nurturing with national and international organisations such as the RICS, RIBA and the CIOB. I am now looking at adding RTPI and ICE to the mix to cover all areas of the sector and make their events more accessible to all our members, whether they’re members of these organisations or not. The mission of the BPA is to bring together property professionals from all aspects of our industry across the region, to provide information, to encourage fruitful relationships and to create business opportunities for all members. The BPA – which is not for profit – now has 1000+ supporters from Weymouth and Dorchester, Bournemouth, Poole, Christchurch, Southampton and London areas. Its members include property professionals across all sectors. If you are involved in the property arena and are interested in attending any of the events, guests are invited to attend up to twice before being encouraged to become members. Further details can be obtained from info@bpa-online.co.uk or by visiting www.bpa-online.co.uk, but be warned, their events tend to book up very quickly, so book early to avoid disappointment.